An alluring necklace design by the talented Karen jewelers. 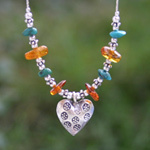 They select amber and turquoise to accompany a hill tribe silver heart. The gems mingle with silver spacers. The necklace is crafted by hand and fastens with a spring clasp. 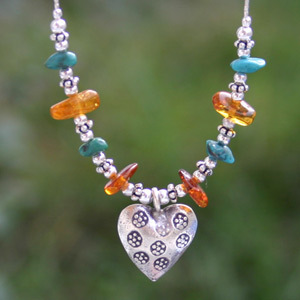 Materials: Sterling silver (.925), amber and reconstituted turquoise.